What was I thinking? That's what was going through my head as it was 1:30 AM and I was still two hours from home. A few months ago I read a short blog post on Pure Michigan about a couple of people that decided to swim in all five Great Lakes in a single day. I'm fortunate enough to have lots of vacation and I thought that it might be cool take a day to try and Paddleboard (SUP) on all of them in a single day (in addition to swimming in them)... and so it began. My goal was to either paddle roughly 3 miles on each lake or surf a few waves if conditions presented themselves. 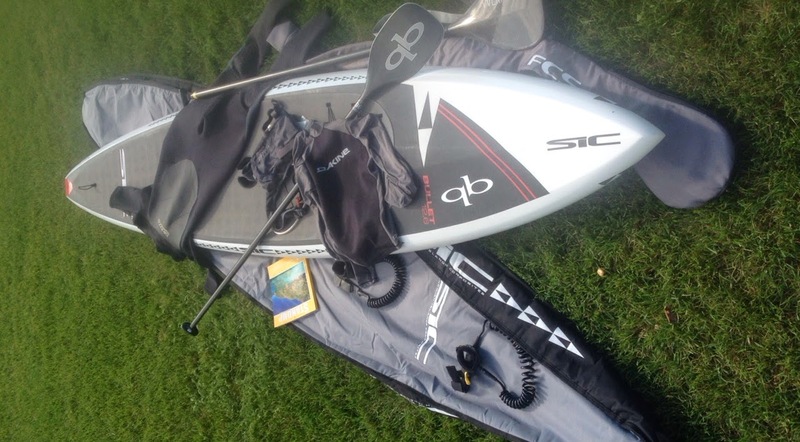 I recently purchased a new SIC Bullet 12'6" board and a Quickblade Trifecta paddle from The Outpost and this would be the perfect opportunity to try them out. I used both Google Maps and Google Earth to map out my route. These tools are great for finding little access areas that can get you on the water fast in spots that are not crowded and don't cost anything. I left my office on Thursday afternoon and headed north. Since I was heading right past Traverse City, it would be a crime if I didn't at least hit West Bay for a quick paddle...even if it was crazy busy with the National Cherry Festival. It was a bit choppy, but any day on the water in TC is a good day. 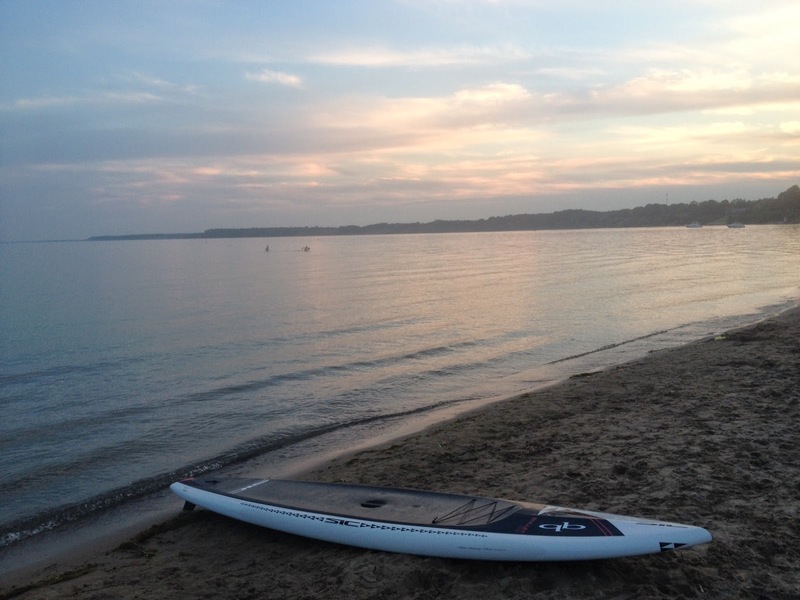 After my quick paddle, I continued along the beautiful Lake Michigan shoreline until I hit the bridge. Although it is an awesome sight, I am not a fan of driving over it...ask my family. Once in the UP, I had to grab a quick dinner. If you've never been to the Driftwood Restaurant, I would highly recommend it. After dinner, I headed on a scenic drive past my Lake Michigan point on my way to my Lake Superior destination. I wont go into detail, but let's just say that once you leave a city in the UP and it's after 10:00 PM, good luck trying to find gas...this little error caused me to drive about 40 miles out of my way and had me coasting into Sault Ste Marie to fill the tank. After gas, I headed to Brimley State Park to catch some sleet (in my car) before the next day's adventure. Lake Superior... I woke up at 5:30 and was quickly on the road to my destination. I arrived at the small roadside park about 20 miles west of Sault Ste Marie and Superior was like glass...what a perfect way to start my journey. The air was around 50, but the water was colder than that. I opted for just a lightweight neoprene long sleeve shirt and boardshorts. It's amazing how clear the water is. I could see rocks that looked like they were just under the surface, but I'm sure they were actually 20-30 feet below. After getting in my 3 mile paddle (give or take) I headed for shore and found that the mosquitoes have woken up...not cool! I quickly jumped in (took my breath away it was so cold) and tried as fast as possible to load up my gear and hit the road before losing pints of blood, but I'm not sure if that happened. As if the bugs on the shore weren't enough, once I got in the car there were probably 1000 in there too. 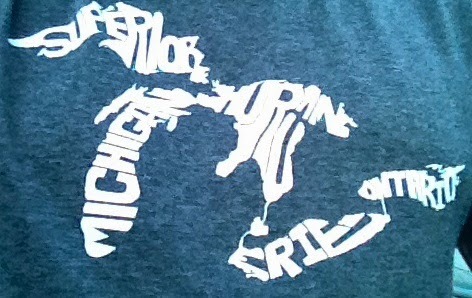 Oh well...time for my hour long drive south to Lake Michigan! Lake Michigan... I arrived at around 8:30 AM a USFS roadside park about 15 miles west of St. Ignace. When I checked the lake, I was pleasantly surprised to see awesome conditions...3' waves and clean! by this time the air was in the mid 60's and the water was the same. I'm in Lake Michigan A LOT, but it is definitely different up here. Although I think of Lk MI as a pretty clean lake, it's rarely "crystal clear" due to all the sediment entering through the many large rivers in the West Michigan area. It's hard to say that the water was as clear as Superior was earlier this morning due to the rougher conditions, it was still glassy enough (even with the waves) to see that it was extremely clear. I ended up having a blast in the waves and ended up staying a lot longer than I had planned...oh well, plenty of daylight to make up my time! I opted to not hit Lake Huron near the bridge, but rather near Port Huron so that it would break up my drive a bit. Off to stop number three! Lake Huron... By the time I got to Port Huron it was 3:00 and I was an hour behind schedule...stupid awesome waves (and Chipotle for lunch). I found this small dead end road "park" with Google Earth and it ended up being the perfect place to hit Lake Huron. By this time the air temp was around 80 and the water was easily over 70. There were only a few people on the beach and according to them it's more of a "locals spot" just because not many people know about it. With the afternoon breeze and all of the boats, the conditions were pretty choppy and unorganized. I paddled for a couple of miles around the 20-30 boats that were anchored and talked to a lot of pretty nice people. Time to hit the road, cross another bridge into Canada, and get to Lake Ontario! Port Huron seemed like a pretty cool town btw...first time I've ever been through there. Lake Ontario... A pretty large lakeside park in Hamilton Ontario was my launching point for this leg of my journey. There were tons of people around and it seemed to be a very active community (at least the small part I happened to see). People were running, biking, rollerblading (yes, people still do this), playing beach volleyball, swimming, walking, and just enjoying the outdoors. By this point (6:30 PM), I'm still an hour behind schedule and am obviously not going to make my goal of 3 miles on each lake. I hit the water and it was warm (mid 70's) with a few small waves. I saw more fish on Lake Ontario than any of the other Great Lakes during my trip...large schools of pretty big fish. I paddled for a couple of miles and talked with a few nice Canadians before packing it in and heading for my final destination. Lake Erie... Port Dover was my final stop. I rolled into town around 8:30 PM and launched at a local beach park in the main part of town. The water was once again warm, as was the air. I was able to bust out 3 miles at a pretty good pace before loading up and enjoying the sunset. Lake Erie didn't seem nearly as clear as the other lakes and there was much more vegetation in the water as well. I didn't end up ever making up the time from earlier in the day, but it was worth it. This park seemed like the place to be to watch the sunset...reminded me of other popular sunset spots in West Michigan. So what was I thinking? 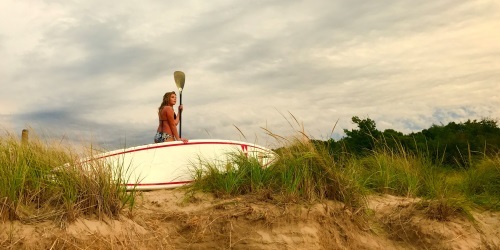 I was thinking that I wanted to do a one day adventure that involved both my passion for SUP and love of our Great Lakes. I'm not sure if anyone has done the SUP + swim in one day thing (I couldn't find any info that they had), but it was more about the adventure than being first for me. I've lived in Michigan all my life and have never been through Petoskey or Charlevoix, never been to Lake Huron or Ontario, and haven't spent much time in the UP and I was able to check all of those off. A few things that I learned on my trip...I still HATE driving over large bridges, going with somebody would have been more fun, this was much more of a driving adventure than a paddling trip, and sleeping in the back of cars is definitely not as nice as a hotel room. One last thing...when driving over the bridge, you get a great view of Mackinac Island. I bet that would be a fun little paddle from St Ignace...maybe next year's adventure! Click this link for the full list of these cool facts. for information on these sites, and many more, check out Vertical Oar...Putting SUP on the map!